David was born Dec 1930 in Snoqualmie Falls, a sawmill town in the Washington Cascades. In 1943 his family moved to White Swan, Wash. on the Yakima Indian reservation. He married Suzanne Shipley in 1953 and the following year graduated with a BS degree in chemistry from the University of Washington in Seattle. Upon graduation he was drafted into the army and subsequently was stationed for 16 months in Giessen/Lahn Germany. Upon discharge he enrolled in graduate school at the University of Washington and obtained a PhD in organic chemistry in 1960. He was then awarded a National Institutes of Health postdoctoral fellowship which was spent for 15 months at the Chemisches Institut, University of Marburg, Marburg/Lahn Germany. In 1961 he accepted a position as a research chemist with the U. S. Dept of Agriculture in Pasadena Calif., working on citrus bitter principles and other chemical constituents of citrus and citrus relatives. In 1968 he accepted a position as professor of chemistry at San Francisco State University. He and his research group continued a research program on the isolation and structure determination of natural products. In 1978 he moved back to the USDA at their laboratories in Albany, Calif. where he spent the next ten years working on the chemical basis of plant-insect interactions. This work has resulted in new theories on how sap sucking insects gain access to plant nutrients. Suzanne Dreyer is part owner of a travel agency in San Bruno, Calif. and they have two children, Mark Dreyer of Bend Oregon and Katharine Weingand of San Mateo, Calif. 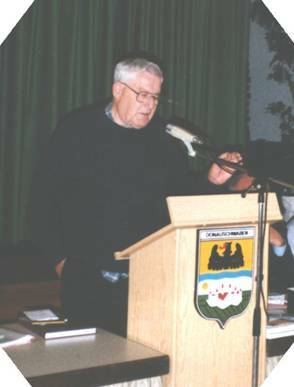 Since retirement in 1988 Dreyer has devoted his efforts to family history research with emphasis on ethnic Germans in the Hungarian province of the Banat. He is the recipient of an Ehrenbrief from the Landsmannschaft der Banater Schwaben for his work on Banat family history research. Work on the Banat has resulted in a series of publications under the title of Banat Family History Series. VOL V. FROM THE BANAT TO NORTH DAKOTA. ACCOUNTS BY BANAT HOMESTEADERS IN WESTERN NORTH DAKOTA, David Dreyer and Josette Hatter, in preparation. VOL VI. BANATERS IN AUSTRIAN MILITARY RECORDS.